A perfectly proportioned, rigorously refined, contemporary villa with pool and inspiring views. Casa Vera's impeccable contemporary design belies a subtle artistic soul, where engineered chiaroscuro effects evolve to the rhythms of the sun's passing and proportions evoke Leonardo da Vinci's golden ratio. Cool, soothing concrete grey runs both inside and out, a perfect foil to the vibrant colours of the surrounding countryside, the dark cobalt pool and the shimmering sea on the horizon. Inside: accommodation at Casa Vera is organised over two areas, the main house and a poolside dépendance. One of the entrances leads into the impressively voluminous and extremely well-equipped, industrial-chic kitchen-diner combining polished concrete floors, walls of glass sliding doors, a thick marble work surface, a large wrought iron-framed dining table, stainless steel appliances and a line of designer light fittings suspended from the ceiling. To one side, sliding glass doors open out onto a panoramic courtyard equipped for dining, while to the other more glass doors bring in the sea and countryside views and provide access to the front terrace. The concrete floors of the kitchen-diner flow through an opening into the living area, which features a bespoke wall of Sicilian ceramic tiles surrounding a fireplace, a variety of designer sofas and armchairs and another wall of glass sliding doors accessing the front terrace. Behind the fireplace wall is a guest bathroom. From the living area a corridor leads to the main sleeping area, comprising a master double with en-suite bathroom, sea views and access to the front terrace, a second double bedroom and a twin bedroom. These latter two are separated by a shared shower room. The remaining two double bedrooms, both with en-suite shower rooms, are situated in a dépendance near the pool and accessed via a flight of external steps linking the main house to the pool area. These two bedrooms share a shaded terrace looking out to sea and over the surrounding countryside. Outside: Casa Vera is blessed with a variety of spacious terraces where guests may dine, lounge, sunbathe and gaze at the sensational sea and countryside views. The first wraps around the main house and has two main areas for hedonistic moments: the front terrace above the pool area, which is accessed from the living area and kitchen-diner; a panoramic walled courtyard to one side of the house, which, thanks to its proximity to the kitchen and the presence of a barbecue and a shaded dining table, is where guests take most of their meals. 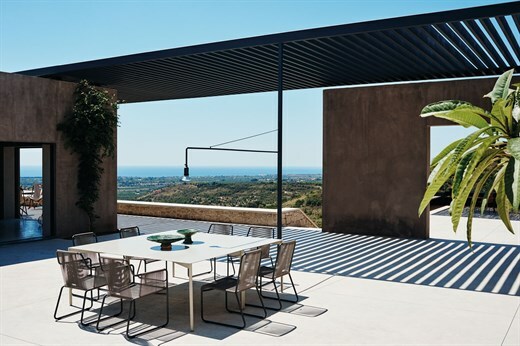 Suspended above the house and part of this courtyard is Casa Vera's unique architectural feature: a seemingly weightless, floating iron grill that casts perpetually evolving geometrical patterns of light and shade. A large rectangular opening in one of the courtyard's walls leads out to another shaded terrace on top of the poolside dépendance, from where the views are arguably the best of all. Furnished for sitting and lounging, this is probably the spot for an aperitif or a post-prandial nightcap under the stars. Two sets of steps lead down from either end of the front terrace to the glorious sea-view pool area, at the centre of which is the stylish cobalt pool complete with a shallow beach-effect plateau. The pool area is served by its own bathroom and a large cane-shaded area. Opposite this, a walkway leads to the dépendance bedrooms. There are some drops around the property, including one from the main house terrace down to the pool area. For this reason, younger children should be supervised by an adult when exploring the property. Casa Vera is set in rolling hills near the fascinating Baroque town of Noto and the beautiful natural reserve of Vendicari. Noto is the most easterly of a chain of baroque towns now protected as a UNESCO World Heritage site. It is also perhaps the most perfect of the baroque towns, which were all rebuilt in flamboyant style following a major earthquake in 1693. Vendicari Nature Reserve boasts some of the finest sandy beaches in Sicily, some of which are pleasingly under populated even in the height of summer. Vendicari is also home to thousands of migrating birds, including flamingos, and sea turtles nest on its beaches. Siracusa is just half an hour's drive away, and a day there is highly recommended to anybody spending a week or two at Casa Vera. A little further afield, the other baroque towns of Modica, Ragusa and Scicli are easily reachable in a day. "Casa Vera is architecturally stunning, the location is fantastic. From the first moment that we arrived we loved being here."